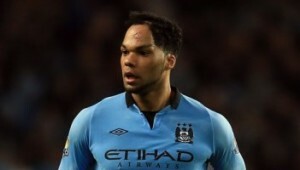 Reports are out claiming that Manchester United are being linked with a shock move for Manchester City defender Joleon Lescott. The Sun claims that the former Everton defender could be a shock summer target for Manchester United. The England defender, 30, has fallen out of favour at neighbours City and his contract ends next year. Lescott, who cost £24million, says he is happy at the Etihad but wants his future sorted ahead of the World Cup.